After months of speculation, Kylie Jenner and Travis Scott have finally let fans in on their personal news that they have officially begun their family together. As previously reported, the reality star and beauty entrepreneur gave birth to her first child on Feb. 1. A couple days after sharing the exciting news both with a statement and an intimate visual showcasing a behind-the-scenes look at her pregnancy, Jenner posted a photo confirming their daughter's name, Stormi. In addition to sharing the highly anticipated update with fans, her announcement post also broke the 'gram, surpassing an Instagram record previously held by Beyoncé. As reported, the post, which was shared on Instagram Tuesday afternoon (Feb. 6), has since been liked over 14 million times and counting. Beyonce's February 2017 post displaying her pregnant belly previously held the record, with an impressive 11.2 million likes. Months later, a photo of Cristiano Ronaldo's family broke the record with 11.3 million. Jenner currently boasts 103 million followers on the social media site, making her one of the most-followed accounts on the entire platform. Her popularity online played a role her decision to take a hiatus from the spotlight, with Jenner explaining in a statement why she chose to enjoy her pregnancy privately. "My pregnancy was one I chose not to do in front of the world," the 20-year-old wrote in her initial announcement. "There was no gotcha moment, no big paid reveal I had planned." Now that her baby has arrived, Jenner has changed her tune in opting to share the news. "More and more, we're seeing the world's most influential public figures turn to Instagram to share their most intimate and personal moments, and in turn, bring Instagram's global community in on the joy and celebration," an Instagram rep shared in a statement about the new milestone. 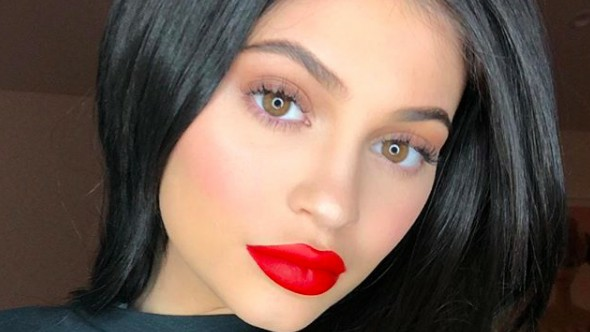 Take a look at Kylie Jenner's most-liked photo, below.